There are many aluminum radiator manufacturers around, and the term "quality" gets thrown around a lot. 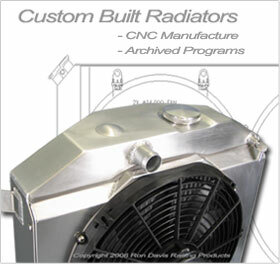 Ron Davis Racing Products uses a completely different approach to quality. Most businesses have to compromise between quality, costs, pricing, speed and customer service. Ron Davis runs the company with the idea that quality is everything, and every radiator will be perfect, or he will just close the doors. He has always believed that if you build the best, you only compete with yourself and will always have a market for those who demand the finest. If this thinking is used in all internal manufacturing and office processes, defects are reduced, automatically reducing manufacturing time, scrap, cost and customer service issues. 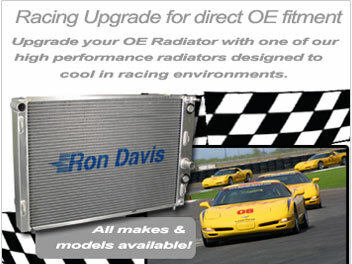 To maintain this level of quality, Ron Davis Racing Products employs Lean Manufacturing for speed and waste reduction. This is the basis for the Toyota Production System that Toyota has used to become the standard for automotive quality. Lean Manufacturing attacks seven different types of waste, including time waste and material waste. Six Sigma Quality techniques pioneered in the aerospace industry are used to further prevent defects. Each process is analyzed scientifically for possible failures and they are prevented rather than being reworked. Major processes are mapped for consistent results and failure prevention analysis. CAD design and CNC sheet metal cutting is used that can hold .005" tolerance with complete repeatability, so each radiator is exactly like the previous one and fit is perfect every time. Human processes are mapped, standardized and monitored for consistency, so personal variation is controlled and training is consistent. Metal grain is aligned during flat pattern CAD layout to insure maximum strength at bends. Machine feeds and speeds are analyzed for their effect on fit and finish, and fittings are checked on go-no go gauges. All machine processes are tightly controlled for consistency. Kanban inventory processes insure detail parts are always available while minimizing inventory costs. Furnace brazed cores insure peak performance for years and eliminates the need for epoxy. And aggressive fin counts for all application assure maximum cooling. Aggressive fin counts are more expensive, and are therefore not used widely in the industry, but Ron Davis Racing Product's racing experience has determined that it maximizes cooling capacity for the hard to cool applications. Wins in every major racing title have proven this to be a fact, not conjecture. Each core is annealed, and the tubes are welded seam, rather than brazed lock seams. The fins are multi-louvered for enhanced air turbulence to maximize heat rejection. Each weld is show car quality, with consistent bead width, dab spacing and penetration. New welders are not permitted to weld production units until their weld quality meets Ron's high standards. Sheet metal details are coated until the weld phase to prevent scratches, and the production work surfaces are designed to prevent dents and dings, so each unit is free of any mars in the base metal finish. Pressure testing at 32 psi insures each unit is leak free and structurally sound. The end result of all this effort and process control is a trouble-free radiator with the highest level of performance that many call "art." Racers believe that failure is not an option, and Ron Davis Racing Products is a company born and bred from racing. This obsession with quality has built a strong repeat customer base of those who need more than just an aluminum radiator- they need the best. Copyright 2015 Ron Davis Racing Products, Inc. All rights reserved.